Michael and Trevor help Madrazo keep his reputation after a family member attempts to take him down. Michael arrives at Madrazo's home followed by Trevor. Michael tells Trevor that he wanted work and this is work. At the front door of the house they are greeted by a woman and once again Trevor takes a liking to her. Michael says they are here to see Madrazo and he is then heard in the background telling the woman - Patricia - to let them in. Inside Madrazo tells Patricia to get them some drinks. Madrazo is in a much better mood since last meeting Michael and welcomes the two visitors. They sit down and Michael introduces his old friend terrifying psychopath Martin Madrazo. Martin says people no longer fear him as much as they used to including his cousin who hit Michael with a bat during their first meeting. The cousin is going to testify against him in court so Michael will wipe him out - as a favor to a friend. Madrazo shows them a picture of cousin Javier. He is flying to Liberty City with some files that Madrazo needs back. There is a gun in the hills and someone watching for the plane. When he flies by they will shoot the plane down. Michael and Trevor leave as Patricia finally brings the drinks but Madrazo scolds her for the bad timing. Trevor will get a vehicle to chase the plane with. As Michael, go to the observatory where the gun is. When you get back to the urban area Trevor calls Michael to say he acquired a dirt bike and understands why Michael brought him to Madrazo's house. Michael isn't sure what Trevor is talking about but Trevor says all the Aztec artifacts could be worth a lot of money. Michael doesn't want to steal anything from Madrazo. He is wealthy and should be willing to pay good for any help he gets. When you arrive at the observatory get in the van parked on the side of the hill which has a large gun in the back. Trevor isn't far out and will be waiting for Michael to shoot the plane down. When you enter the van the electronics powering the gun will load up and controls are displayed. You are told to shoot the plane's engines. The jet is shown on the screen by a tiny red blip to the left of Downtown LS (Michael says southwest but it's really northeast). He notes that he'll need to lead his shots. When you zoom in on the plane a red target is shown in front of it. Shoot at the target and successful hits will be shown in quick cutscenes. The plane takes three hits to go down. You must get it before the plane gets too close to the airport. SWITCHed to Trevor, chase after the plane. There is no blip on your radar so it is all by sight but Trevor is also listening to air traffic radio while keeping Michael up to date. Follow the plane and smoke trail into Blaine County. You'll leave roads altogether but the path to take is pretty clear. There are a few predetermined jumps and vehicle obstacles but keep the gas going and drive on through. 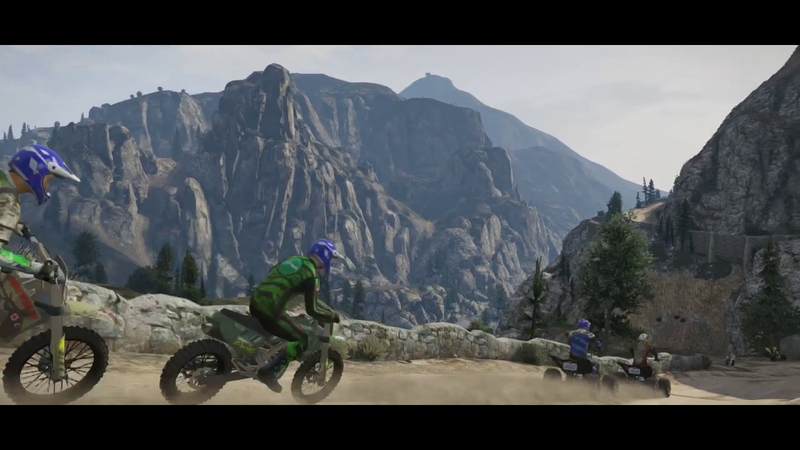 While zipping through Sandy Shores Trevor comments how he misses the area. Eventually the plane crash lands in Grapeseed. When you arrive at the scene kill Javier before he kills you. Enter the plane and Trevor finds a briefcase in the cabin. After exiting the plane Michael calls and tells Trevor to drop off the files. Trevor says he will discuss their pay but Michael forbids him. Michael needs to get rid of the gun and then they'll discuss payment with Madrazo. SWITCHed to Michael, leave the area and then dispose of the van. You are given a Jerry Can if you wish to use that. When it is destroyed go to Martin's house. Trevor will call and say there is a small change of plans. Meet him at Stoner Cement Works a little north of Madrazo. Meet Trevor at the cement works. Trevor will arrive shortly after Michael in Madrazo's SUV. Trevor comments on Madrazo's attitude and sees why people stab him in the back. Michael becomes very worried and gets Trevor to admit he kidnapped Madrazo's wife Patricia. They'll need to lay low for a while during talks with Madrazo. Trevor knows a cabin in the woods type place where they can stay. Michael hops in the SUV and they drive out of there. Trevor and Michael now go into hiding so you are SWITCHed to Franklin who is in a park with Chop. The plane will appear just to the left of the IAA building's roof so zoom in around there. Once you see it zoom in all the way for steady aim. Shoot the plane down as soon as possible. The route to follow with Trevor shouldn't be hard to see. There are some spots that are a little tight or questionable. The important part is to keep accelerating and don't crash. The trick to getting 100% speed on the Sanchez is to lean forward a little (not all the way). 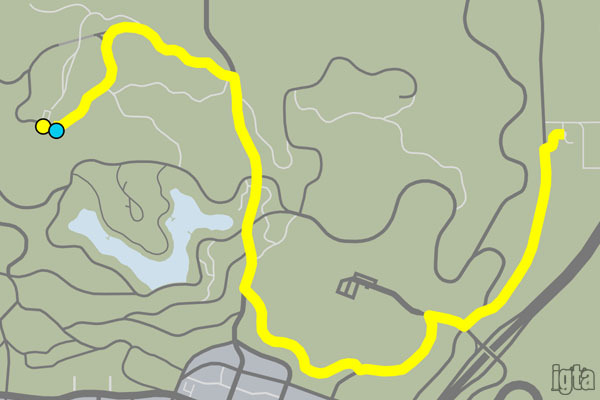 If you have trouble staying with it on the mountain take Joshua Road after jumping the train (main road running along the tracks and Sandy Shores) and get up to speed along there. Drive right up to the crashed plane. Quickly kill Javier and run to the plane's door. If you do the mission correctly, disposing of the van and getting to the cement works can kill time. 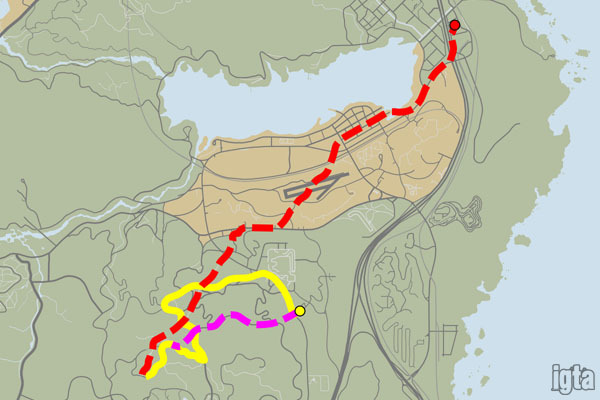 Best approach I found was to drive the van straight to the cement works while taking shortcuts down mountain sides as shown in the map above in purple. Pull up near where the marker spawns and destroy the van. Then skip through the call with Trevor and get in the marker if you aren't already in the spot. This can save plenty of time. Floor It - Reach top speed on the Sanchez. Glued to the Seat - Don't fall off the Sanchez during the chase. One Two Three - Shoot down the plane with 3 shots only. Mission Time - Complete the mission within 09:45.